Imaginary Affairs—Postcards from an Imagined Life by Frances Kai-Hwa Wang is a collection of prose poems and short short stories which wanders, dreamy and droll, across the landscapes of Ann Arbor, Berkeley, Kathmandu, Hawaii, and Asian America, wrestling with ache and desire, searching for the moment, but the moment is ever fragile. The book is hand-crafted with all sorts of old-fashioned book-making techniques by Laura Beyer of Wax Wing Press. The cover is hand pressed, the binding is hand sewn, the detailing is all antique fonts and dingbats. Especially beautiful in this digital age. and at Amazon (ebook for Kindle. Thanks to M!). Kerrytown Concert House will be hosting an opening reception for photographer Jyoti Omi Chowdhury’s new exhibit, “Boots of Spanish Leather,” together with a reading by writer Frances Kai-Hwa Wang, on Tuesday, August 7, 2012, 5:00 to 7:00 pm. This exhibit will run through September 4. Kerrytown Concert House is located at 415 N. 4th Avenue, Ann Arbor, 48104. (734) 769-2999. www.kerrytownconcerthouse.com. Jyoti Omi Chowdhury’s photography exhibits the equipoise between space and human identity. Most of his photographs were taken at various warzones and dictatorships, from Somalia to Burma. Instead of replicating and imitating the dire conditions that are part and parcel of human existence within these warzones, Chowdhury’s photography captures the levity, beauty, and randomness of people’s lives in these places. It is ultimately a homage to undying human spirit that refuses to wither even in the most desperate of circumstances. Chowdhury and Wang will also discuss their latest collaboration which brings together their mutual fascination with landscape, light, space, identity, and human spirit, together creating dreamy and droll scenes that linger in the imagination, whether set in a Somali warzone or in a downtown Ann Arbor café. Jyoti Omi Chowdhury was born in Dhaka, the capital of Bangladesh, which in his opinion is infamous for torrential rain and back alley cricket. His formative years were spent daydreaming about women and soccer, under the cusp of a military dictatorship. He moved to the wilderness of the American prairies and western Canada for his university education, and eventually wound his way to Harvard. In between all this tiptoeing, rapidly developing wanderlust, he began to research and write on genocide, gender equity, war theory, and liberalism. During his PhD research and fieldwork, he found an outlet in photography. This will be Chowdhury’s third solo show, and his first in Michigan. His previous solo shows were in Boston and Berlin. Frances Kai-Hwa Wang is a second-generation Chinese American from California who now divides her time between Michigan and the Big Island of Hawaii. She is a contributor for New America Media's Ethnoblog, Chicagoistheworld.org, PacificCitizen.org, InCultureParent.com. 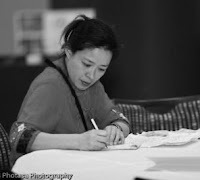 She was the arts and culture editor of IMDiversity.com Asian American Village for many years, and she wrote a column called “Adventures in Multicultural Living” for AnnArbor.com and AnnArborChronicle.com. She teaches writing and Asian Pacific American History and the Law. She is a nationally popular speaker on Asian Pacific American, multicultural, social justice, and social media issues. Check out her blog at www.franceskaihwawang.blogspot.com. Omi Chowdhury & Frances Kai-Hwa Wang: Kerrytown Concert House.